This subject would have to be one of the most important questions I am asked. 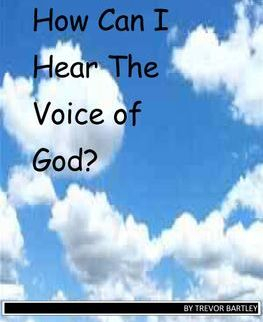 In this booklet I will endeavour to answer the question of, “How do I clearly hear the voice of God?” People find it very hard to tell the difference between the Holy Spirit and their own spirit or mind, because we have never been told what the voice of the Holy Spirit sounds like or how to hear it. We have only been taught that it is a soft gentle voice, ‘an unction from your belly’, ‘a knowledge not from your head’, or just a ‘knowing’. Have you had it explained like that to you? I believe that I have found the missing link, and as you read this book you will be shocked as I was to see how much information is actually in the Bible regarding this soft still voice, which you can and do hear. I hope you enjoy reading my discovery as much as I enjoyed studying this subject for myself. I have been a little reluctant to write about this subject for two reasons. One is because the ‘revelation’ is still unfolding and our understanding still growing. Anything published may soon become inadequate. Yet I now feel compelled by the Spirit of God to write, because the time is short, and the days a surly revealing the birth pains of the earth. The second is, when you commit something to paper in some systematic way it can sound narrow, binding or legalistic. Yet this subject is at the forefront of everyone’s minds at the moment and the days we live in we need to truly and clearly hear the voice of God. I feel inadequate for the task, and yet find I am carrying a burden of the Spirit about something which, after having been sent on many occasions to preach around the world, they must be written. I hope that the message will bear much fruit to the honour of Christ. This book has been written without legalism being intended, and the exercise of authority is to be liberating, never controlling. I would ask for the best possible intention to be applied in the light of this intention.